The locals still call it horse country, but much of Potomac has been turned over to the Washington, D.C., area's wealthiest residents. Multimillion-dollar homes and estates fill the town, which sits on the banks of the river for which it was named. If you are of an equestrian bent, the area still offers a number of riding schools, breeders and stables. 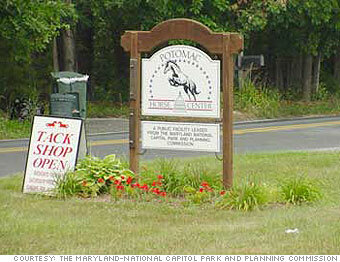 The Potomac Horse Center, a public facility leased from the state, offers an extensive teaching program for riders at all levels.